IA stylish hat can sometimes be the saving grace to an outfit, just as it can also be the accent that brings everything together in a great way. 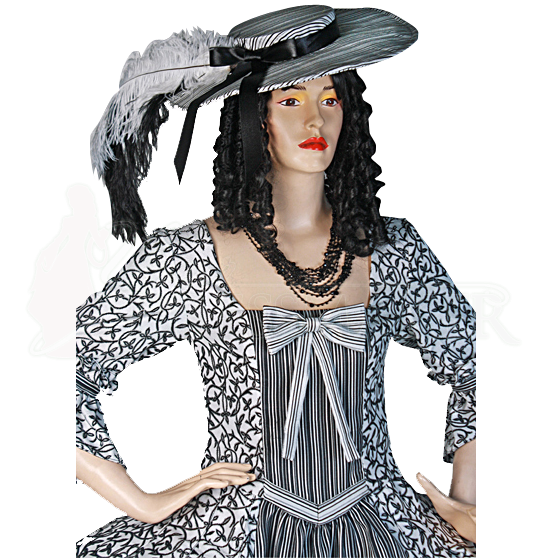 This Monique Renaissance Hat is just such an accent, one inspired by stunning and rich renaissance era design. This lovely hat is quite the sight to see, thanks to its unique design. It features a shallow crown and a wide brim, having been designed to sit atop the head but not encompass it. The low-set crown is wrapped up in a black ribbon, which accents the beautiful black and silver jacquard fabric, and set with two ostrich feathers, for that ideal touch of eccentricity. A wire is sewn into the hat to ensure that it keeps its shape properly. The hat measures approximately 47 inches around, and has a diameter of 15 inches. For a unique touch of style, sometimes you need that eccentric accessory. And if you're going for a rich and noble renaissance lady, than this Monique Renaissance Hat might be just the accessory that you need. This hat can be made from any of our fabrics. If you don't see the color you wish to order in the drop down menu, please contact us to set up a custom order. See our Fabric pages for all available options.